A parliamentary report of 1777 recorded a parish workhouse in operation at St Austell for up to 60 inmates. Cornwall: St Austell (6), St Blazey (3), Creed, St Dennis, St Ewe (2), Fowey (2), Gorran (2), Grampound, Mevagissey (3), St Mewan (2), St Michael Carhayes [Carhays], Roche (2), St Stephen in Brannwell [Brannell] (3), Saint Sampson, Tywardreath (3). Later Addition: Fowey (from 1894). The population falling within the union at the 1831 census had been 27,659 with its parishes ranging in size from St Michael Carhayes (population 197) to St Austell itself (8,758). The average annual poor-rate expenditure for the period 1834-36 had been £8,424 or 6s.1d. per head of the population. 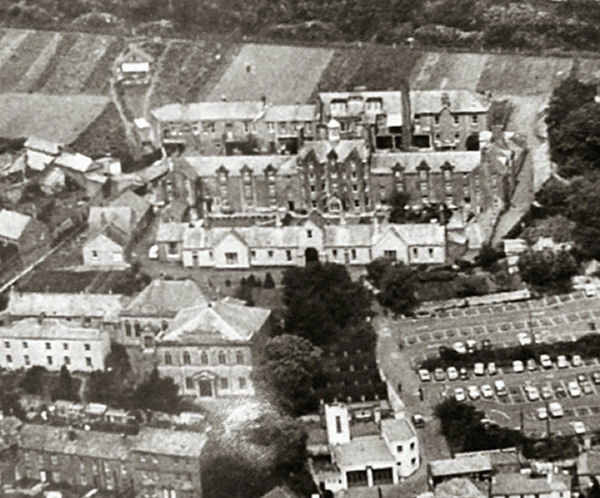 St Austell workhouse, aerial view from the south, date unknown. St Austell followed Scott and Moffatt's typical design. It had a single-storey front block with a central entrance archway. To the rear was the main accommodation block, three storeys high, and having the Master's quarters at the centre. An infirmary block stood to the rear. A new infirmary block was built at the north in about 1914. After 1930, the workhouse was redesignated as a Public Assistance Institution. After 1948 it became Sedgemoor Priory Hospital providing care for geriatric patients. It closed in around 1969 and all the buildings subsequently demolished. Cornwall Record Office, Old County Hall, Truro, Cornwall, TR1 3AY. Holdings include: Guardians' minute books (1839-43, 1845-8, 1890-2, 1897-1930); Ledgers (1905-15, 1918-29); etc. Thanks to Kathy Anstiss for the photo.